The Shoal Floating Tent is essentially an eight foot by eight foot dingy with an inflatable roof that allows a fully grown adult to stand up in it. It comes with a foot pump and is just like sleeping on an air bed; only one that is floating about on water. We assume you can tether it, either to a jetty or to the lake bottom, as letting yourself drift around over night might be a bad idea. Or the really awesome start to an incredible adventure. 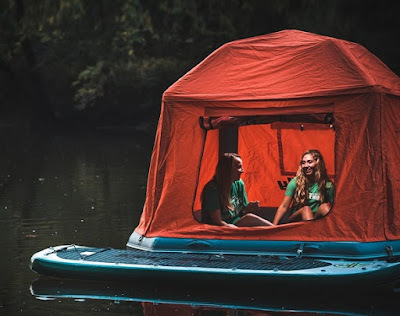 If the water is calm, we could imagine this being a great way to camp, and certainly a pleasurable and enjoyable kip. It might be a good idea to check the waters for crocodiles and alligators, though. Just a thought. 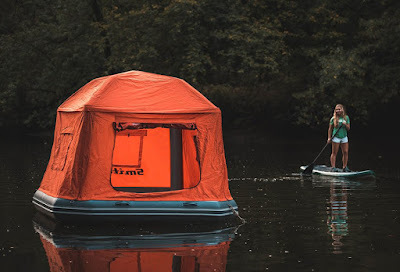 Mind you, this ain't cheap; the Shoal Floating Tent will set you back $1499 from here.